If you are not familiar with CPA, then let me run you a couple of things before I get into my CPA Drill Review . CPA stands for Cost-Per-Action and sometimes it is also referred to as Cost Per-Acquisition. Cost per action is an online advertisement payment model that allows an advertiser to pay for qualifying actions such as sales or registrations from a prospective customer. 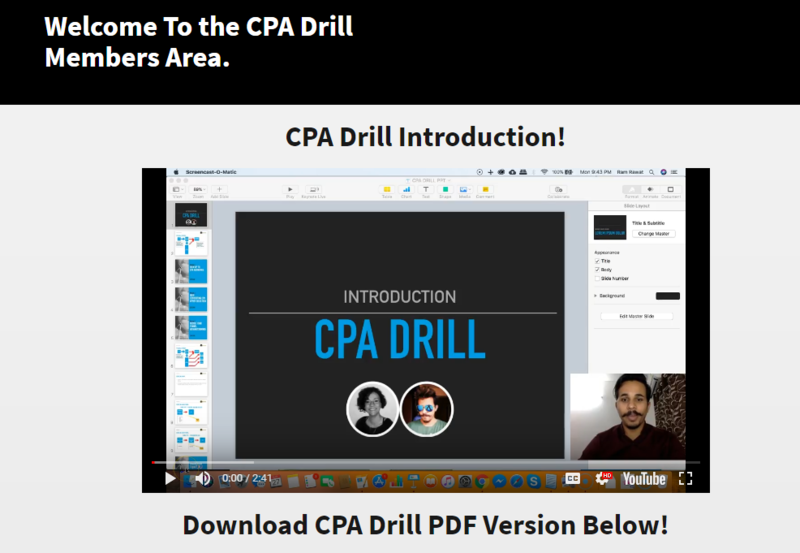 CPA Drill is a step by step method with 76 pages of PDF with 17 over the shoulder videos turns a total newbie into CPA pro. It takes you through 6 different modules of the training. Access is also given to top landing pages and google text ads in top 5 niches (MMO, health, real estate, banking and employment) Special Affiliate Recurring Income Case Study. As a bonus. 6 Figure Coaching Program (Recurring) – Direct access to building a 6 figure business using this 6 figure coaching program. Direct access to Ram and Ivana’s email to ask any questions you may have. Ok so that is al the upsells that wil be offered through this funnel. Let us take a look at the members area, the training and how cpa drill works. When you access the members area you get the welcome video which runs through additional information about the training and what you can expect to be learning through out the course. Let us take a look at how this cpa programme works and comes together through each of the modules. So in this first module, you learn how to sign up to cpa networks. These are the networks that will be paying you your commissions. If you have had any previous issues signing up for cpa networks, this video will help you how to go about things in the easiest of fashion. In this video, you will learn an important part of cpa marketing, finding the right offer. It's important that you pick the right types of offer that are going to make you money. This video reaveals what to look for when picking cpa offers. In module 3, you'll be learning baout the type of funnel you need. You will be going through ideas on which funnel you want to go with and how to set up that funnel. Module 4 consists of 3 videos. 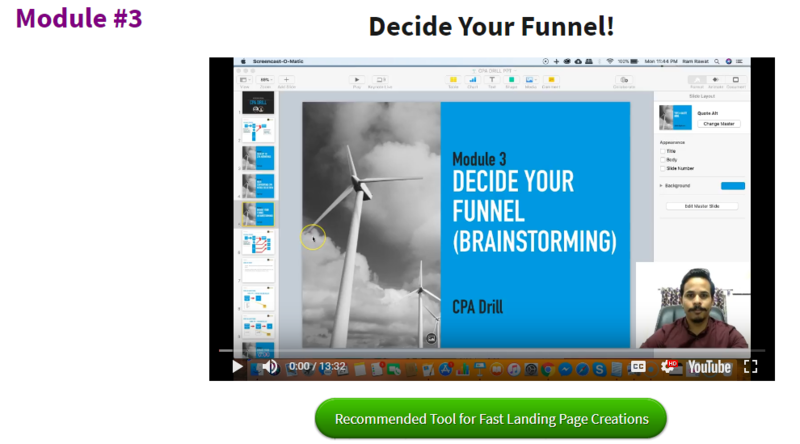 The first video continues from the previous video where you learned how to decide on the funnel. 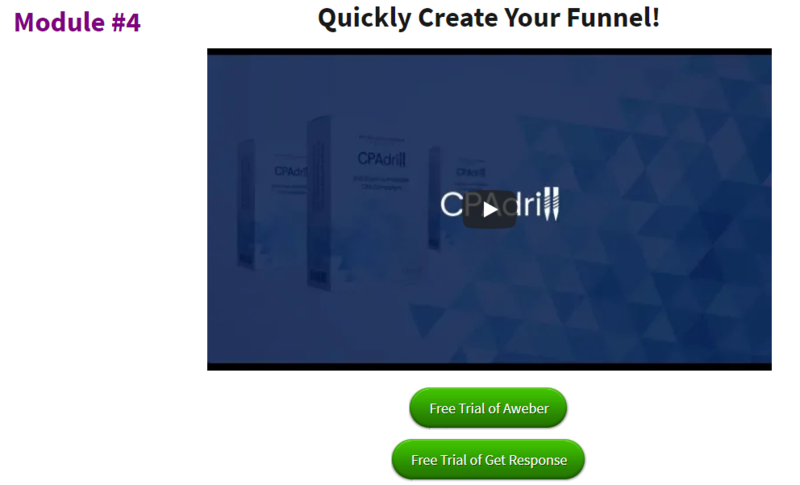 This video shows you how to quickly create your funnel. In addition to this video, you also access the other videos which deal with creating landing pages quickly and there is also a slow version of how to create landing pages. These pages will be where you send all your potential customers to your offers. There are also various resources relating to elements in the videos that are recomended if you need them. In module 5 of CPA Drill, we talk about getting traffic to your offers and how. This particular module consists of 9 videos and offers a wide variety of traffic sources and methods. This module in my opinion is the most critical part of the whole training. 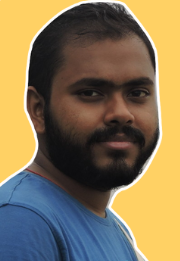 No matter how good your campain funnel may be, without traffic, it is totally useless so attention should be paid to this whole module which is dedicated to traffic generation. In the final module of cpa drill, you get the pleasure of a real case study that gives you results using the training set out in this course. The case study reveals working offers, how the text ads were set up, how display ads were set up, how much traffic the campiagn had and how much the campaign made. This is areal insight on how a good cpa campaign should be constructed and this is exactly what you are being taught through out this training course. 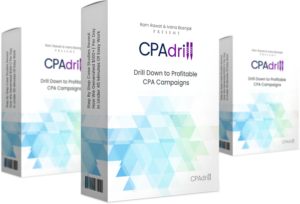 Who Should Buy CPA Drill? In my opinion, i would usually say that this type of product should be reserved to those that are familiar with cpa marketing. Having gone through this training, i have concluded that it is not just refined to any one particular criteria. as first thought. This training is really newbie friendly and anyone who has never entered cpa marketing before would feel very comfortable with this training course due to the ease and quality of the step by step training that is being recieved. This entry was posted in COST PER ACTION, CPA MARKETING and tagged cpa drill, cpa drill best bonus, cpa drill bonus, cpa drill review, cpa drill upsells, get cpa drill by Anoy. Bookmark the permalink. Next → Next post: Insta-Minator Review and Bonuses : Does Insta-Minator Really Helps?